Cloud technology is currently redefining IT infrastructure as we speak. Companies are presenting their cloud solutions at rapid speed and new cloud products are being announced every week. It seems that every vendor is on the cloud train and wants their customers to hop on too. Question however is : Is your company ready for the cloud transformation? As with all new technologies it also requires a different mindset. A new way of thinking about how to incorporate the cloud technology into your company. Cloud requires a new vision and strategy with regards to the IT infrastructure in your company. It’s a transformation process and the key is not in the technology, but in the organization adjustment. 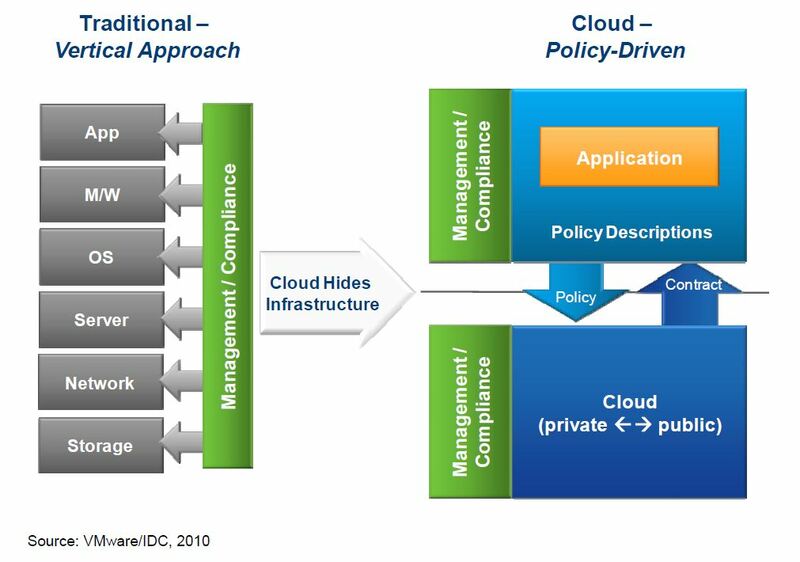 The picture below (click to enlarge) gives a good representation of how the traditional, vertical IT management approach is being transformed to a cloud, policy driven approach. More information about transforming and integrating cloud solutions with your IT infrastructure can be found in the whitepaper “Accelerate Hybrid Cloud Succes: Adjusting the IT mindset” by IDC here. This whitepaper was sponsored by VMware. See the press release here (Dutch).